Over the course of the past few years different industry specific associations have conducted statistical studies about the frequency in which this type of testing is performed in the pharma industry and the results indicated that the test is executed normally prior to each batch of a production run. However as far as performance requirements the question is still open: which hole diameter should I be able to detect? The theoretical answer would probably be 1μm (bacteria spores diameter), but the practical answer is much larger due to technological limitations at this time. The methodologies of testing available today are many, but few of them may be automated and many times they are not suitable for the routine. Moreover today it is difficult to find equipment to test the integrity of gloves that comes with performance qualification (PQ) and this is mainly due to the lack of test repeatability. Although there are many different methods available in the industry, the method used by the greatest portion of the users to test the integrity of the gloves is the Positive Pressure Decay method which follows the international standard ISO 14644-7 Annex E.5. The ISO 14644 Part 7 doesn’t detail specific methodologies for the Positive Pressure Decay. In terms of acceptance criteria many different interpretations can be reached. The box below shows what the ISO norm states about the test procedure and the results. When the sealing cap is placed over the glove-port ring, a space is formed between the cap and the inside surface of the glove. This space is then pressurised to 1000 Pa and allowed to stabilise. A drop in this pressure will indicate a leak through the glove fabric or securing arrangement. The following steps should be followed. Prior to commencement of test it is important to visually inspect the glove/gauntlets for any obvious damage. Make sure all fingers on the glove extend into the separative device. Connect the air line to the separative device. Adjust manometer to zero by pressing the “zeroing button” while holding the glove-leak tester in free space. Small variations of ± 3 Pa to ± 4 Pa from zero will not adversely affect the result or the sensitivity of the tests. Fit the sealing cap of the glove-leak tester over the outer port ring of the glove to be tested. Inflate the glove by operating the valve. The gauge of the manometer will display the pressure within the glove in pascals. The glove should be inflated to a minimum of 500 Pa and a maximum of 1 000 Pa; this may take a number of injections of air to reach the required pressure as the system stabilizes. Observe the reading on the manometer. A stable reading will indicate a sound glove. With experience, operators will be able to identify potential problems in a 10 s test period. Suspect gloves/gauntlets should be re-tested, and a longer test period may be required to confirm results. If the glove/gauntlet is sound, then the reading shown on the manometer will remain static within 2 Pa to 10 Pa, subject to the small variations noted in E.5.3.2. If the glove/gauntlet is damaged, then the reading shown on the manometer will fall (i.e. 500 Pa, 495 Pa, 490 Pa). This trend will be distinct and progressive. The rate of change will be proportional to the level of damage to the integrity of the glove. Any test showing probable damage should be repeated. Any tests that record a distinct change in pressure should be closely investigated and the fault (e.g. incorrectly positioned cuff ring, damaged glove) either re-tested or the suspect glove/gauntlet changed and a successful test conducted. Many questions can arise from such a simple test procedure and such a wide interpretation of the results. What is the performance of this method? Which hole diameters will I be able to detect? The first step is to create a mathematical model which can describe an inflated glove with an orifice, as this will provide you with a formula relating to the hole diameter for the expected pressure drop. Unfortunately the calculation is very complex due to different elastic properties of the glove material (different elastomers, thickness, and sizes) so different strategies need to be followed. The glove materials available in the industry vary (Hypalon, Butadyl, Neoprene, EPDM). In particular, Hypalon is a mixture of polymers such as plastic and rubber, with a very different reaction to stress and elasticity. These gloves, very common in aseptic applications, result in more of a challenge to integrity testing than other types of materials. Thickness and size, together with the flange mounting, greatly contribute to the determination of a customized testing procedure for each kind of glove material. Therefore an experimental approach needs to be strictly followed. “Closed System” — brand new glove correctly mounted on the flange. “Open System” — brand new glove correctly mounted with a calibrated hole device connected. 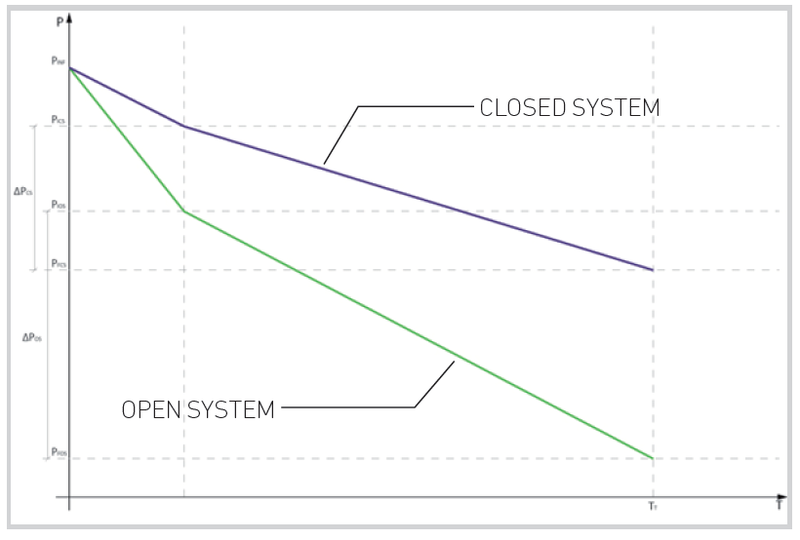 The expected behavior of the two systems should be like the one shown in the graph below. Characterization of the Closed System: Study the pressure decay curve at several inflatable pressures (< 1000 Pa) (3) and collect a statistica set of data from these tests. Characterization of the Open System: Study the pressure decay curve at several inflatable pressures (< 1000 Pa) for the hole whose performance we are trying to prove and collect a statistical set of data from these tests (4). The objective is to locate the value of these paremeters so that they will correspond to a significant difference between the Pressure Drop of the Open System (ΔPos) and the Pressure Drop of the Closed System (ΔPcs), i.e. ΔPcs — ΔPos . The statistical deviation of the collected data needs to be as small as possible and the accuracy of the pressure transmitters must be considered in order to reach an effective and valuable acceptance criteria. Basically what we look for is a large difference between the slopes of the two curves based on the collected data of the two systems during testing: a smaller difference between the two curves may result in a longer overall test procedure time until a significant difference is observed. As such, the equipment and the test can be easily validated while the specific glove and fixing mechanism (flange and counterflange, o-ring, etc.) 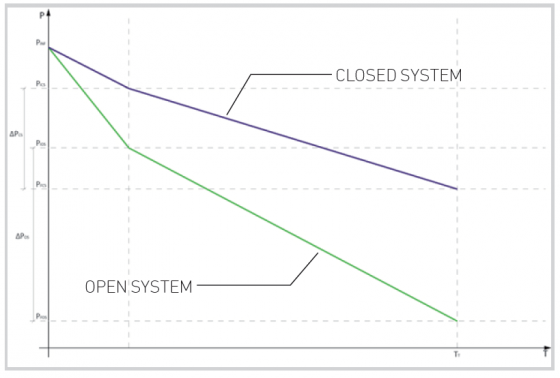 is characterized in terms of “normal leakage” (Closed System curve). Before running the test, it is important that the integrity of the machine running the test is also verified and assured. With the method described above a variety of hole diameters can be detected developing the correct test parameters.However the detection limits are primarily influenced by the precision of the adopted transmitters, statistics involved and time constraints. Using this method with a calibrated hole of 100 μm a high level of reproducibility and a very, very low frequency of false positives has been observed. This means that an automatic glove tester machine may be easily validated. Lower detection limits may be achieved by the use of smaller calibrated hole sizes, but this practice will impact the reproducibility and the probability of false positives. Data collected and PQ protocols in this study are available upon request. (4) Dedicated software able to run consequent tests and to record data is used for data collection both on the Closed and Open systems.